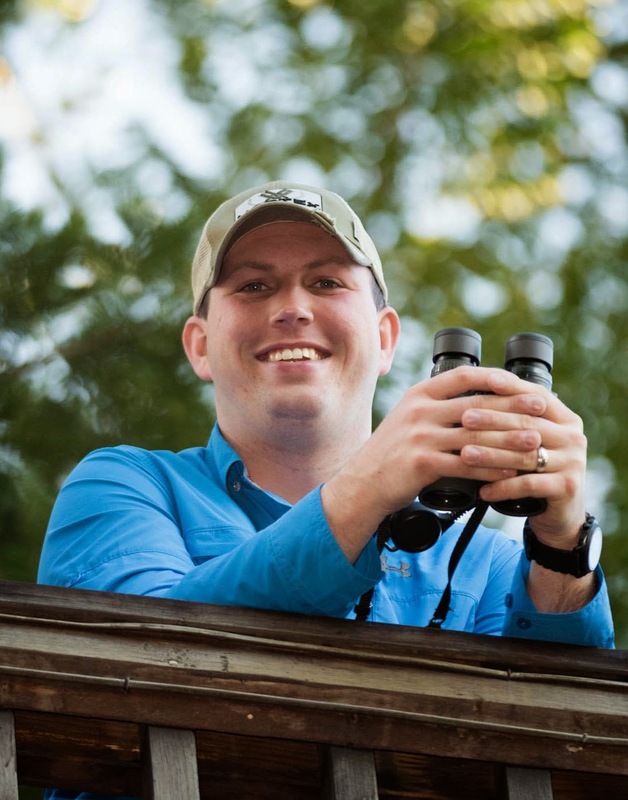 ***This guest post is written by Brian Zwiebel. Brian is an award-winning photographer that has been published in international books and magazines. One of the many things that makes him a great photographer is his understanding of the identification and behavior of his subjects. If you'd like to learn how to get incredible photographs, join Brian on one of our Sabrewing Nature Tours photography trips. 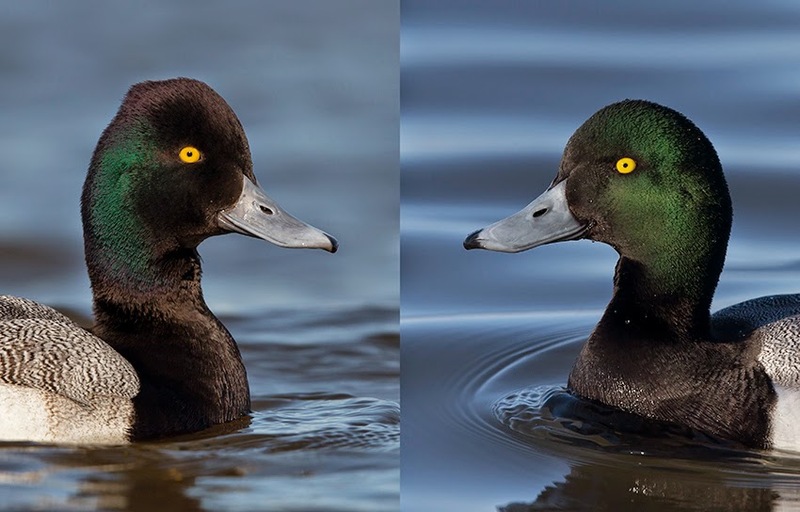 Over the years I have repeatedly heard that head color is a great way to separate the male scaup species; blue for Lesser Scaup (LESC) and green for Greater Scaup (GRSC). There are several problems with this method. First, this does nothing to help us with the females. Second, in poor lighting such as back lighting or heavy overcast, the head will be nearly colorless appearing black even at relatively close range. Lastly, when viewing in good light the green head for male GRSC is quite reliable, however more than 50% of my LESC images show a bird with a green head. The following images and captions will illustrate a number of other key field marks to consider. Comparison photos will show the Lesser Scaup on left. 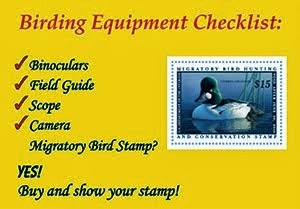 reliable field mark but unfortunately most birds will be too distant for it to be of much use. 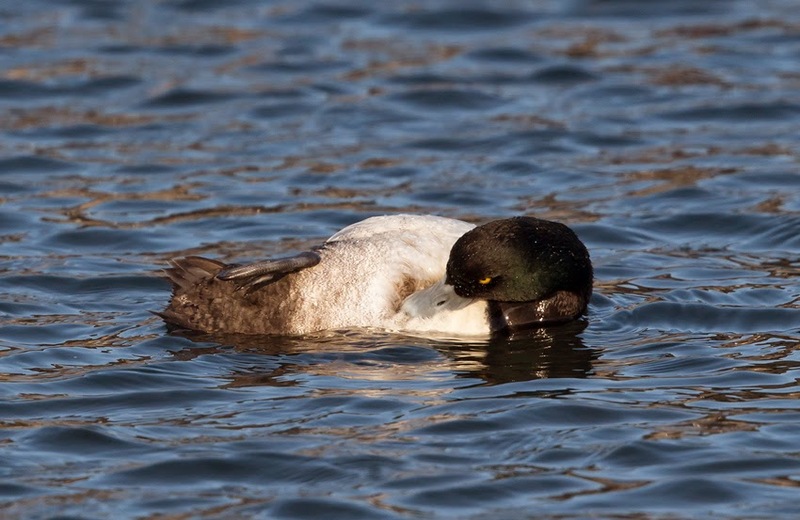 difficult to discern on female scaup as it lacks the rich black of the nail found on the males. a bird is in perfect profile as in the first head comparison image. in on some likely candidates. 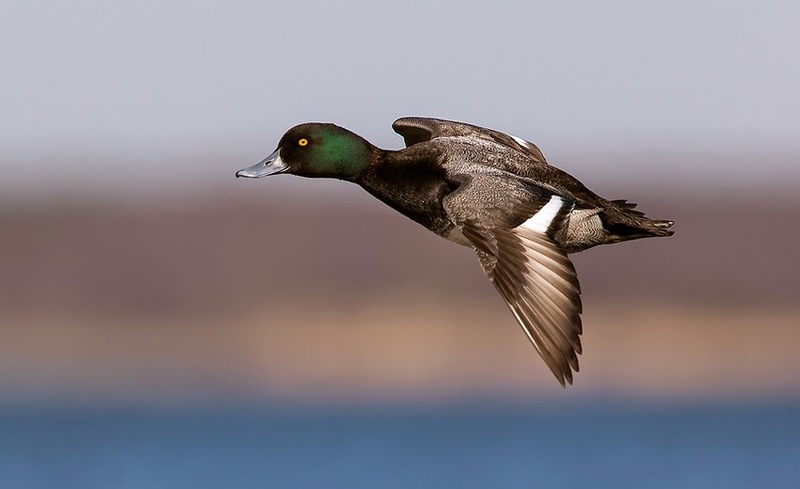 Sometimes with the above clues scaup ID can be quite straight forward. Other times we need to rely on the preponderance of the evidence. While weighing the evidence it is good to keep a few additional things in mind. First, head shape is difficult to judge in flight. This is a LESC showing a green, roundish head. indicator for GRSC may in fact be the very white belly of a LESC. 1/2,000th of a second. Here we can see the GRSC wing stripe is quite a bit longer. Even with quality optics and a great understanding of scaup identification we are sometimes left with no choice but to label a bird as scaup species and there is nothing wrong with that!